Coronary computed tomography angiography (coronary CTA) is increasingly used to rule out and detect coronary artery stenoses. Beyond stenosis detection, the ability of coronary CTA to characterize the anatomic, morphological, and physiological features of coronary plaque has generated considerable interest in the context of pre-procedural planning for coronary revascularization. Specifically, pre-procedural CTA datasets can assist interventional cardiologists with the development of a stepwise revascularization strategy plan including selective catheter placement, appropriate guidewire choice, and accurate stent size selection. 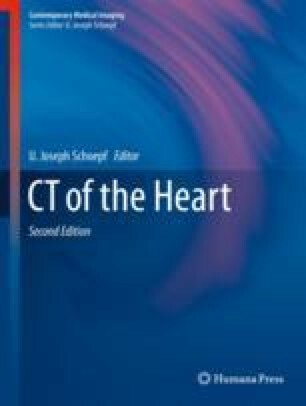 This is particularly salient in cases where noninvasive CTA exceeds the characterization of coronary lesions compared to invasive angiogram (e.g., chronic total occlusions) and has been successfully employed to predict the procedural outcome of coronary revascularization. In addition, coronary CTA can identify high-risk plaques (e.g., low-attenuation plaque) that are likely to cause periprocedural complications (e.g., no-reflow phenomenon) and may thus require tailored revascularization strategies. Of particular interest, the procedure itself may be facilitated by projection of three-dimensional CTA data directly to the catheterization laboratory. Continuous research is clearly needed, but coronary CTA is already gaining recognition as the only imaging tool for crossing the borders between noninvasive and invasive management of coronary artery disease.